Parblue: Part Blue or Partial Blue is a multiple allele of the Blue gene. When the gene is fully active, you get a Blue mutation. But the gene can also be partially activated and you get the Parblue mutation.There two different Parblue mutations found in Peachface Lovebirds; Turquoise and Aqua. Aqua (Dutch Blue) - closer to green in colour and has a orange brow. Horn colored beak. Turquoise (Whiteface Blue) - dark green/blue and has a cream-white brow. pink colored beak. **AquaTurquoise (Seagreen) - Combination with orange brow. Two toned beak; pink at top and horn at bottom. Lutino - Yellow all over with a white rump and red eyes. - means split. It is in their genetic make-up but does not show visually. Cobalt - A bird that has a single dark factor. Mauve - A Parblue bird that has two dark factors. Olive - A Green bird that has two dark factors. Creamino - A Parblue version of a Lutino. The bird has a white/cream face and red eyes. Pallid - Resembles a Lutino, but the bird has blue tail feathers. Edged Dilute - An eumelanin reducing mutation. It affects most noticeable the mantle, where you will see an 'edging' or 'pencilling' effect on the wings. The flight feathers are grey, and the rump is lightened. =Cobalt Parblue SF Violet <-- this is a very nice bird, deep purple in color. 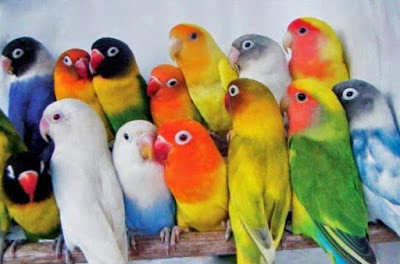 Demikian Keterangan Cara Perkawinan Silang Burung Love Bird Agar Menghasilkan Warna Warna Yang Indah dan Unik semoga bermanfaat.